I am a Ugandan conservation biologist. I work and live in Bwindi Impenetrable National Park (Bwindi) where I manage the biodiversity and climate monitoring activities for the TEAM Network. I studied a BSc in Forestry and an MSc in Biology at Makerere University and Mbarara University of Science and Technology, respectively. After completing the Diploma course, I will start collecting data for my PhD. My PhD study will be the first attempt to resolve the human-African golden cat (caracal aurata) conflict around Bwindi. 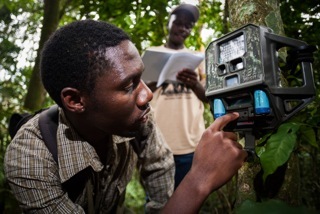 The study will integrate local peoples’ opinions (from questionnaire interviews) and ecological data (from camera traps and telemetry) to mitigate poultry/livestock depredation. The results will be crucial for harmonizing the African golden cat conservation and poultry/livestock production around Bwindi.